This coat is made upon order, please allow two weeks for delivery. Designed for WARMTH in Wet Weather, Rain or Snow, the Panache Green Camo dog coat will protect your dog. Our latest addition, this unique coat is made of a waterproof outer layer, and is fully lined with polartec fleece. This coat is designed for EXTREME COLD, where warmth is required with additional protection from rain and snow. All Panache Dog coats are designed with a unique “chest protector”. Held snugly in place with the adjustable belt, the chest protector provides an extra layer of fabric over your dog’s chest and keeps your dog’s belly warm and dry. Read more about the special features of the Panache coat. 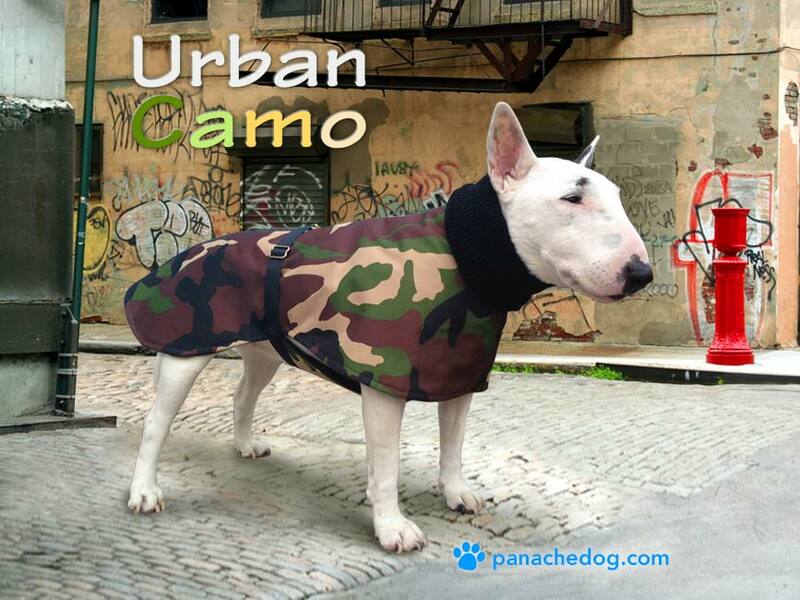 The Panache Camo dog coat Features a Pro Tuff Waterproof 20 Ounce Camouflage Woven outer layer, PVC Coated, it is extremely durable, and washable. Fully lined, with 300 count Polartec Fabric, for additional warmth. • Rib knit collar unfolds for extended warmth, and fits snugly on the neck. • Chest protector fully lined with our Polartec Fleece keeps your dog’s chest and underbelly warm and dry. • Adjustable belt with all Brass hardware, to ensure a comfy fit. • Designed for temperatures down to zero, for warmth. • Offers protection from rain and snow.